Tonight I was looking through my cookbooks (I have quite a large collection) and I came across one of the most entertaining ones I have ever read. On Rue Tatin is a cookbook with a wonderfully written story of how the author came to own a ramshackle convent in France, renovated it & started a cooking school. Ms. Loomises writing is so descriptive it transported me to the french countryside with her. Her interactions with shopkeepers, the butcher who wrapped & tied her whole chicken so beautifully it was like a present, the grouchy priest who kept trespassing in the garden….it was like I was talking with an old friend while she rambled on about her adventures and I loved it. 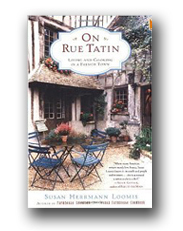 I have made many of the recipes from On Rue Tatin and I can’t even say I have a favorite, the food is always delicious and gets rave reviews from my family and friends.